NYC Apple Store Scrapped: Area Too "Middle America"
Not quite feeling the "middle-America" vibe on 34 St. in midtown Manhattan, Apple has pulled out of space it leased for a new Apple Shrine Store. The four-story digs would have covered 30,000 square feet at $5.5 million a year. I can't say I blame them—that area is kind of "bleh" and doesn't really fit Apple like the Soho or Fifth Ave. stores do. 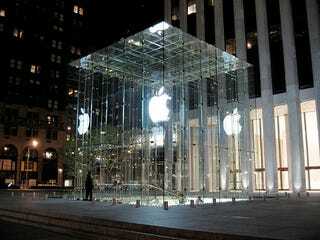 And I mean how do you top a giant glass cube with a glowing, beckoning fruit that's open for worship 24/7? That said, let the accusations of Apple elitism and class war begin!